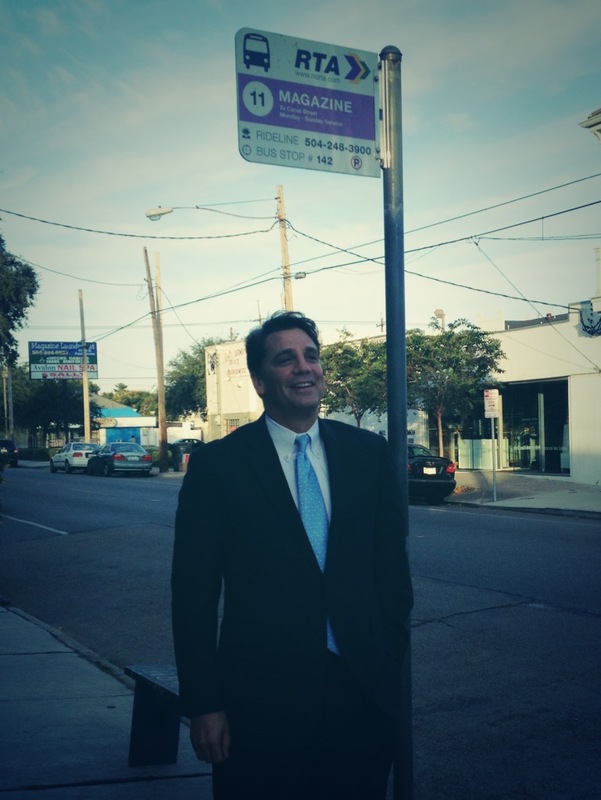 Ride was thrilled for Andy Kopplin – one of New Orleans’ top public officials – to participate in Transit Week 2013. On Thursday morning, we joined the Deputy Mayor and Chief Administrative Officer for an early morning journey aboard the Magazine Street bus and Loyola-UPT streetcar to City Hall. While we waited for the bus, the Deputy Mayor checked out two of the new transit apps popular that have come online since the RTA opened their transit data – Transit Hub and NOLA Transit. Kopplin was impressed by how easy it was to see the GPS coordinates of the bus and to receive estimates on its arrival based on it’s real-time location. As a regular transit rider, Kopplin understands the value of transit to the local and regional economy. Not only did he help launch the popular LA Swift bus to Baton Rouge as the former head of the Louisiana Recovery Authority, but Kopplin relied on the service while he was living in Baton Rouge. 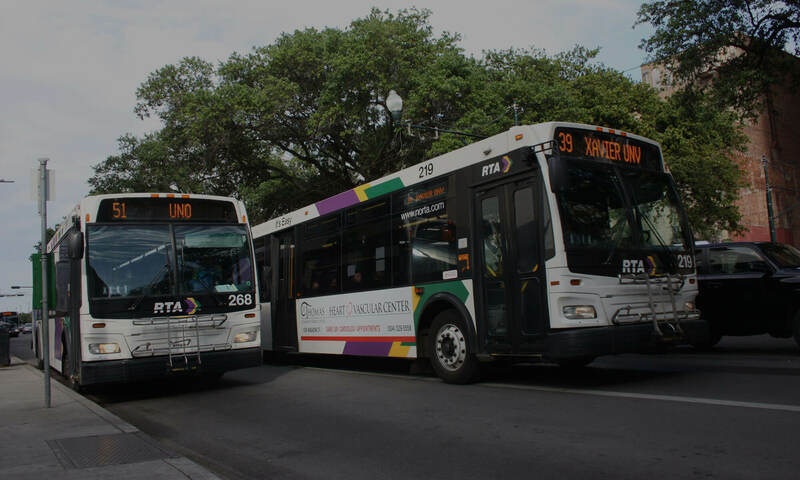 He recognizes that the State’s decision to terminate the LA Swift bus in July has had very real impacts for the many riders who relied on the bus to commute to jobs throughout the region and cited the restoration of a public transit link to Baton Rouge as one immediate opportunity for New Orleans to seize on. Aboard the packed Magazine Street bus, we spotted several school children on their morning commute to the St. Alophonsus elementary school. Deputy Mayor Kopplin pointed out the transportation challenges that schools, parents and students face in the new decentralized and open enrollment school landscape that has emerged post-Katrina – just getting to school has become an expensive proposition. Always a solution-oriented thinker – Kopplin discussed the opportunity for schools to invest in RTA transit passes for students. The dedicated revenue to the RTA could help to expand bus and streetcar connections to the schools in a win-win scenario for everyone. 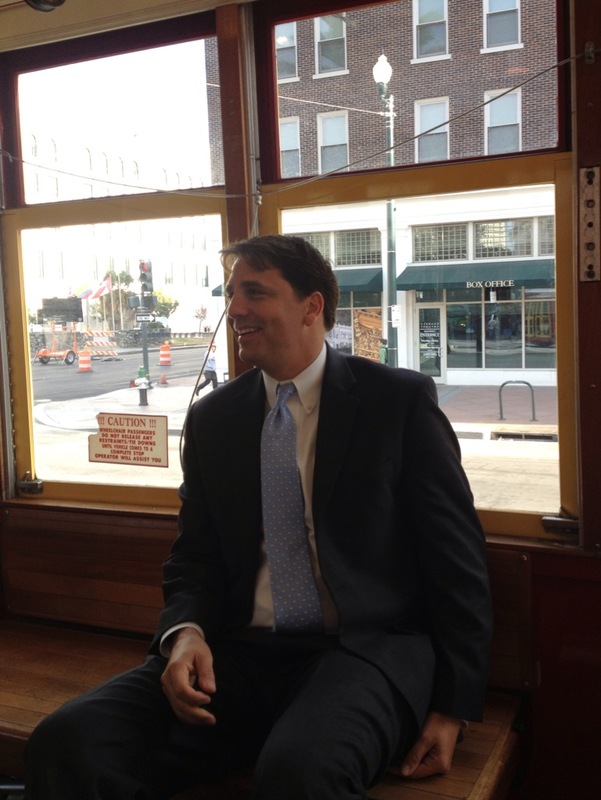 After an easy ride into the CBD, we transferred to the Loyola UPT streetcar for the quick trip to City Hall. As a former Washington DC resident, Kopplin explained that he rode the subway to commute to work on a daily basis and appreciated the chance to read the newspaper and relax on his commute. When asked if the New Orleans transit system could ever rival DC’s, Kopplin quickly and confidently replied that it can be “even better.” We’ll second that!